There is still a paucity of English-language books about the German experience of the First World War, and what does exists tends to be about the experiences of the infantry fighting on the western front. Bernard Deneckere’s work on the German Air Force is therefore a welcome addition to the library. The book presents a chronological account of the development of the German Air Force in the attempt to win the air war over Flanders. Most people will know that the Germans invaded Belgium in 1914, but how many know that the invading troops were supported by a number of aeroplanes carrying out reconnaissance, and dropping bombs (albeit rudimentary ones) and propaganda leaflets? When Britain joined the war the German reconnaissance patrols reached as far as the Belgian coast in an attempt to discover the British movements. As the war progressed the role of the Air Force changed alongside the development of technology and tactics. Improved communication between planes and the ground led to aeroplanes being a key tool for the observation of artillery positions and troop movement, and therefore for the direction of artillery fire onto enemy targets. Control of airspace in the sky above the front lines therefore became vitally important. At the beginning of 1916 the German air force had the upper hand, however with the Somme offensive this changed. The air force was reorganised and more fighter pilots were recruited to counter the increased Allied air presence in the region. The introduction of the Jagdstaffeln (hunting squadrons) in autumn 1916 saw them start to regain the upper hand. As the German army was pushed back during the final offensive of 1918, so too were the planes. The book ends rather abruptly with the end of the war; a conclusion or overall analysis of the development and impact of the air force on the course of the war in Belgium would have rounded the book off nicely. The book details of the actions and movements of each German squadron and the planes they were using, in addition to well-researched accounts of air battles and the losses incurred on both sides. Other topics touched on include the Naval Seaplane Squadron, zeppelins, and even the use of pigeons. The number and scope of illustrations is astounding. From archives and what seems to be a huge personal collection, Deneckere provides copious maps, aerial photographs, and pictures of the men and machines of the air force. 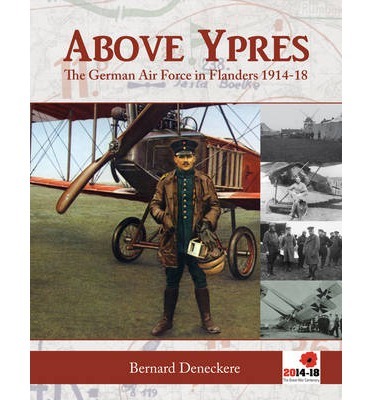 Above Ypres is filled with fascinating snippets of information as well as providing a comprehensive account of the development of the use of the aeroplane during the war, making this a handy reference work as well an interesting read.